Located in Midtown, YOTEL New York is a leisurely stroll from popular sights such as Jacob K. Javits Convention Center and Broadway. This 4-star hotel has 713 rooms and welcomes guests with a restaurant, free in-room WiFi, and a fitness center. Sit down for a leisurely bite to eat at the onsite restaurant, or enjoy a drink at the bar/lounge. Get a pick-me-up at the coffee shop/café. For your convenience, a full breakfast is available for a fee. Guests can expect to find 32-inch an LCD TV with cable channels and Netflix, along with free WiFi and wired Internet. The bathroom offers a rainfall showerhead, hair dryers, and free toiletries. Other standard amenities include free local calls, a laptop-compatible safe, and an ironing board. At YOTEL New York, guests have access to a fitness center, a rooftop terrace, and free WiFi in public areas. Parking is available for USD 45 per night (USD 62 per night for valet parking), and there's also limo/town car service. Multilingual staff at the 24-hour front desk can assist with concierge services, luggage storage, and dry cleaning/laundry. Other amenities at this boutique hotel include conference space, a business center, and a computer station. YOTEL New York, built in 2011, is an ultra-modern, largely automated hotel, offering a luggage-storing robot should you arrive early or are staying in the city after check-out, a restaurant with communal tables that can be raised and lowered, and an airport-style check-in desk with self-serve monitors. The hotel includes a restaurant, a lounge, and a terrace bar with fire pits. Wireless Internet access is complimentary throughout the hotel. Multiple small meeting rooms, dry cleaning, tour/ticket assistance, and multilingual staff are also available, and the hotel includes a fitness center. 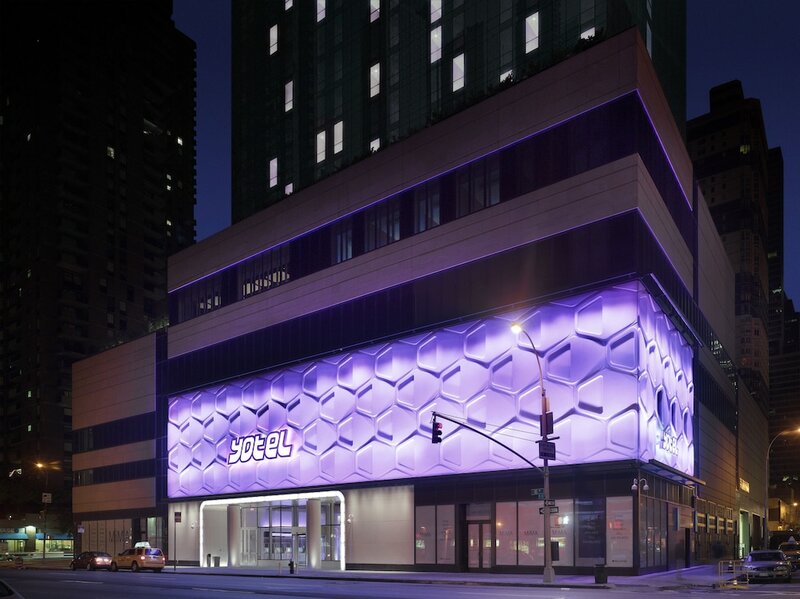 YOTEL New York offers 713 air-conditioned accommodations with laptop-compatible safes and hair dryers. 32-inch LCD televisions come with premium cable channels and Netflix. Bathrooms include showers with rainfall showerheads, and complimentary toiletries. Guests can surf the web using the complimentary wired and wireless Internet access. Business-friendly amenities include desks and phones; free local calls are provided (restrictions may apply). Additionally, rooms include irons/ironing boards and blackout drapes/curtains. Housekeeping is provided daily. A breakfast is served at YOTEL New York. East and West - East & West offers shareable small and large plates that pair perfectly with a curated wine list and signature cocktails. Open daily from 7 AM to 11 PM, East & West is the perfect spot to eat, drink, meet, work, watch, and play during your visit. Club Lounge and Bar - Serving a menu of drinks and snacks. Terrace - NYC’s largest hotel terrace, serves the East & West menu and is a great spot for outdoor dining or to grab a drink during the warmer months. YOTEL New York includes a fitness center. This property offers self-service check-in kiosks. For more details, please contact the property using the information on the reservation confirmation received after booking. The tubs are available for use only from May 15th through September 15th for the First King Terrace and the VIP Terrace Suite rooms. For more details, please contact the property using the information on the reservation confirmation received after booking. This property charges a mandatory deposit of USD 500 per night for bookings in the "Suite, 1 King Bed, View (VIP)" or "Penthouse, 1 King Bed (VIP)" room type. Any unused portions of the deposit will be refunded at check-out. For more details, please contact the property using the information on the reservation confirmation received after booking.